The First Satellite To Orbit The Sun Did So When It Missed What Target? People Suffering From Psychopathy Frequently Have Impairments in What Physical Sense? 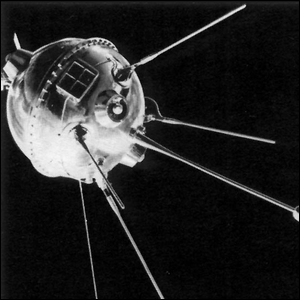 The Russians managed to pull off three space exploration firsts with a single spacecraft: Luna 1. The small spacecraft was intended to be a lunar impactor, destined to slam into the surface of the Moon and report data back to Earth, but thanks to an error along the way it was destined for a much longer trip. During the launch sequence, an improperly timed burn stage changed the launch trajectory and Luna 1 missed the Moon. In the process it became the first spacecraft to reach the vicinity of the Moon (but, unfortunately, not land on it as intended). In missing the Moon it became the first spacecraft to leave geocentric orbit and eventually came to enter a heliocentric orbit (becoming the first man-made object to do so). Renamed Mechta (or Russian for “Dream”), it now orbits the Sun in an orbit between that of Earth and Mars. Despite missing its intended target, Luna 1 proved quite useful and was able to report back data about the Moon as it passed by, the Van Allen radiation belt, and take measurements of the solar wind.